I hope everyone had happy, healthy holidays. To enter please leave comment on this post telling me about some quilty-related item that you are excited about creating this year or some product or new fabric line that you can't wait to use. (Please become a follower if you aren't already.) Don't forget to leave me a way to contact you should you win! The deadline is this Friday, January 6th, at midnight. Happy New Year with lots of sewing! 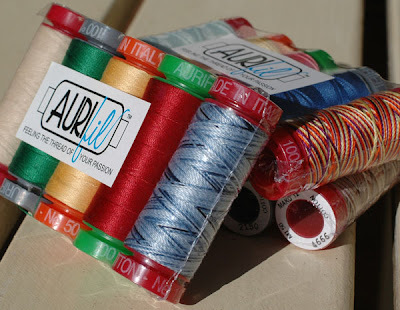 I would LOVE to try some Aurifil thread! I read Alex's Jolly Jabber Interview. Aurifil sounds like a quilters dream come true. I am working on a King Size Quilt for my sister in law and will be Free Motion Quilting it. This thread would be wonderful to work with! Thanks for the giveaway! I'm excited to make an i-spy quilt for my little guy, along with whatever other sewing projects I can squeeze in :) Thanks for the giveaway! I just tried Aurifil for the first time on a Christmas quilt. I did some heavy free motion quilting and it was fabulous to work with. I want to explore the possibilities with all the different weights and types of thread. Thanks so much for great blog and the giveaway. I have fallen in love with Jane Dixon's Primitiva Collection, and would love to make a lap quilt with it. I love Aurifil thread for all my peicing work. I'd love to try some Aurifil thread! I want to finish some UFO's and start a 'Garden Fence' quilt!! I read the Jolly Jabber interview. Ok now I know I need this thread! Actually I have heard nothing but wonderful things about it on the blogs I read. I am going to attempt a drunkards path quilt this year I have been wanting to do one forever but the curves leave me shakn' in my boot! This year I will master the curve! I have a long list this year, but I'm most excited to make some wonky house blocks. I also want to try a Jacob's Ladder quilt. I follow! I'm going to finish my wedding quilt, and I'm just trying to find the right materials to piece it and quilt it (Aurifil might be the thread!) thanks for the chance! I'm still fairly new to quilting, and I'm hoping to do some quilt-alongs this year to try some new techniques and more complicated patterns. Thanks for the giveaways! I'm excited to make an I-spy quilt for my son. I'm also into mug rugs right now, and want to try some new techniques, such as sketchy applique - where you use the black thread to stick down your shapes. I plan to finish some projects first, but I'm looking forward to doing some applique this year. Thanks for the giveaway! Thanks for the great giveaway! I'm in desperate need for more thread actually :) I'm currently undertaking my first large quilt. It's a scrappy quilt for our queen size bed. I'm having so much fun making it! Love Aurifil! I just received a Go! excited to create/cut with it! I would llove to win some threads, I'm a follower already. The other day I was a guest blogger and made a tutorial for owl hot pads, check out my blog for a link to it. I plan to finish some projects and meanwhile I `d like join small projects. I`m a follower.Thanks for the chance to win. I am collecting 4 patches to make charity quilts for cancer patients - I have been gifted with nearly 2000 patches already, so I have lots of assembling in the months ahead. It is such a great feeling! I cannot wait to make that first delivery. I am excited to make a 10 year anniversary quilt for my son and daughter-in-law this year. I am excited about making aprons with my daughter for gifts this year and making a lap quilt for my dad. thanks! i'm eagerly anticipating the release of "salt air" by cosmo crickets - its fabulous! thanks for the chance! I am just learning to quilt and am excited about finishing my first quilt. This is the year I'm making a quilt for my bed! I've made them for my kids, grandkids, friends and relatives but never for myself. My bedroom needs a major overhaul and this is the year to get it done! Great giveaway. I am waiting and waiting for your blue Swiss Chocolate line to come out so that I can make a new quilt for my bed. What pattern I will use? I have no clue. YET! My bucket list is getting too full I just needed to add the quilts for grandkids, birthday is coming up in February. I am excited about my "fabric diet" this year. I plan to use many of the scraps and such from my stash. I just received the More Nickel Quilts by Pat Speth book. I hope to work through it with my many scraps. I still need thread! I'd love to try Aurifil! Thanks for the chance. I'm going to finish my very first quilt this year. I am, I'm going to do it!!! I'm excited about my first quiltalong it's a sampler with Sew Happy Geek. Right now I'm still thinking of what four fabrics to use. I'd love to use some colorful Aurifil thread to quilt it! I am excited to jump into Bonnie Hunters' Orca Bay Mystery that has just finished. I am a big chicken when it comes to snall piecing but taking the plunge in 2012! Thanks for the chance to win. I'm really excited to finish my Jewel in the Crowm BOM from 2011 and quilt it! I am already dreaming of the colors I want to use to quilt! I am looking forward to a great year of quilting! I am planning to finish several quilts since I recently learned to do long arm quilting at my local quilt store. I'm also planning some new quilts, the first will be of deep jewel tone Kaffe Fassett fabrics for my Mom. I love Aurifil thread - I've been using it for piecing for a few years. It is almost lint-free and is so fine my bobbin lasts a long time. I don't see my post...sometimes too impatient to see if word verification takes. I'm new to the sewing world - I'm excited to create my first quilt this year! My hubs ordered a Sew Steady table for me for Christmas. I'm waiting on it to get here and am super stoked. It's going to help hold the weight of my large quilts while I'm quilting, which will be a huge help. I also want to tackle a Zig Zag quilt this year. Love Aurifil thread! Thanks for the great giveaway! I'm excited to start working on the quilt kits I purchased last year along with gifts I have in mind for family and friends. Thanks for the generous giveaway. I started a quilt this weekend that is so bright a cheery... a large Carpanters start for a lucky 9 yr old! I am also looking forward to taking more classes with my quilty friends. I hope to finish quilts for my bed this year - I have multiple sets of blocks done, and now must start assembling. I am a happy follower! This year i am going to try to be more organized and sew more gifts~ I hope! I would love to try the thread in some of them. Thanks for the chance! i love aurifil threads, too! i'm edge stitching applique with some right now! i'm all excited about starting sewcalgal's fmq course and have promised myself i'll stick with it. I am looking forward to finish some of my Ufo's and start to learn more abiut embroidery! Thanks so much for the lovely give away! I love Aurifil thread and so do my sewing machines! I loved to read the interview. I think it's just great that manufacturers produce in an environmentally friendly way and set an example that it is possible. I am excited about the first quilt I am tackling this year which is all wonky stars. It's a recover well and quick quilt for my MIL who is having double knee replacement. I have always wanted to try Aurafil thread! This year I would like to make a postage stamp quilt. For me is I may be purchasing lots of batiks FQ bundle. A potential big customer wants baby quilts in batiks. I AM EAGER TO USE SOME OF MY 'SCANDANAVIAN CHRISTMAS' FABRICS! THANKS FOR SHARING! I have a ton of batik fat quarters, so am working on some project to use those up! I've joined my first swap and my first quilt-along. Very exciting! Started a class on Craftsy, looking forward to the slower pace and hoping it allows me to get some smaller projects done, too. Can't wait to try out this thread as I've heard so much good about it! I'm excited to make a couple Christmas quilts I've been planning to do for awhile (a snowman one and a Merry Christmas one)--but I'm not letting myself start until I finish a couple things I'm in the middle of. Would love to give some different Aurifil threads a try! I am excited to finish my Orca Bay quilt. Oh gosh...so many projects so little time. I've posted several links on the rights side of my blog with so many wonderful things happening in blogland for 2012...check it out! There is no possible way I can keep up but sure will be fun watching everybody work feverishly. :-) I'd love a win of Aurifil...never tried it...love seeing that variegated one!! Yum!! Great giveaway Amanda! I am excited about finishing my Vignette in Stitches Mystery BOM quilt. Loving the colors and design so far. I would love to try this thread. As for projects, I have 3 baby quilts and a farmers wife project going. I would like to quilt more - particularly finish what I have started. I am excited to make something with Echo this year. I am a follower!! Thank you for the chance to win! I want to learn how to do some free motion quilting so have joined a year-long challenge. I just started using red aurafill for embroidery blocks and was so impressed that I ordered more in blue! I JUST finished my Clubhouse 2011 quilt! Seriously! JUST FINISHED! Start the 2012 this weekend! Also doing a BOM this year and I found a neat website where the gal is having a free-motion quilting project this year that I am going to try. Need to hone my skills and quilt my own stuff. BTW, I love Aurofil, great quality AND value. Love the enviromentally friendly aspect that was discussed. I just ordered some neutral colors yesterday after reading the article. Would love some bolder colors to add to my new ones. Fab! Been hearing lots of good stuff about these threads and read the interview! I am excited about a FMQ challenge I am participating in @ sewcalgal. thanks for the chance to win! I'm hoping to join more swaps this year. I'm in a Wonky House swap and hope to join more....without getting overwhelmed. Thanks for the thread give a way! This year I would love to try needle turn applique. I want to finish up some of my ufos, such as the first quilt I made. I lost touch with the friend I was making it for and just found her after 5 years! I also want to make placemats for my MIL, for each season of the year. My list could go on and on! I love piecing with Auriful. I try to keep a spool of light gray and a light beige tone. They blend with most any projects...which I'm not so sure matters in piecing anyway. I'd love to try some of the colored threads for FMQ on my regular sewing machine...which is the only way I can quilt lol. I am very environmental and will have to read that interview! Thanks for the chance for the threads. I'm a follower. I'm excited to dig in my UFOs this year. It's my year to clean out stuff and somehow I've collected a few sewing projects. i want to make a toddler dress this year- i have never made clothes before! I am going to tackle my first queen-size quilt this year and hopefully conquer my fear of sewing clothing. :) Thanks for the giveaway! I already follow you and enjoy reading your blog...I am excited about making a Christmas quilt and a quilt for my bed this coming year. Thank you for the opportunity to win some of this great thread. I'm looking forward to starting the hand quilting on my DWR. It's the middle of summer here is Australia so I'll be waiting a bit until it gets cooler! Thanks for the chance. I have some of Aneela Hoey's "A Walk in the Woods" that I can't wait to turn into a quilt for my little girl. I am excited to learn to use a handi quilter at my LQS for those bigger quilts! A friend and I are planning to each make a major top-stitch applique quilt this year, and I'm busy collecting batiks. That's the fun part! Now if I had some Aurifil to stitch it with, I'd be a happy girl! I'd love to try Aurifil! i'm waiting for the new Tula Pink line. This year I plan to make a quilt for my brother - something with an outdoorsy look. Thanks for a chance. I would love some of this wonderful thread. I am excited about working on a monkey wrench quilt made out of Denyse Schmidt fabrics. Just started it yesterday and I am loving it! Thanks for the Aurifil giveaway! i have joined my first block swap, so I'm pretty excited about that! Thanks for an amazing giveaway. I participated in 2 charm swaps last year and I would love to make a couple quilt tops from all thoses cute little morsels of fabric. Thanks for the great giveaway! This year I plan to make a quilt for my kiddos! I look forward to cutting into my Hometown fabrics and ... unrelated ... getting and trying a dresdan ruler. Love dresdans though I've never mad them. I'm a bit of a begginer at this quilting thing. Also, thanks so much for the chance to win! Aurifil is the BOMB! Aurifil threads would be great for the fabric collage vest that I'm working on at present. I'd love to get into doll making but I'll have to do that during the night as I'm so busy already during the day. Thanks for the chance to win this lovely little package!! PS Of course I am a follower!! I'm already a follower. I would be excited to make myself finish any of my UFOs.....smile. I just finished my Swoon Quilt and it looks great. Next, I'm starting your Garden Paths. I can't wait to teach a confident beginner's class on both... I love Aurfil, I've been using it for 10+ year. My e-mail: jmyers0925@yahoo.com. I am a follower. i Would real love to try Aurifil threads I have been reading so much about them. I am hoping to make my husband a quilt this year, and I have a few others I would like to complete. I need to machine quilt two before end of January. I'm going to get back to my first king size quilt this year; very exciting as it's for our bed. Love to try this Aurifil thread. My current project list is to sew few blouses for myself!! I need more tutorial on sewing adult clothe. I have so many quilts I want to make I can't possibly list them all! In addition to the ones I already want to make there are about a million quilt-a-longs I want to do! Right now in beginning of this new year I have an adventurous list of what I want to do this year and the main this is to work on new techniques - hexes, y-seam, cording, etc., in addition to sewing some badly needed clothes. Sure could use some great thread! Thanks. Yeah! Made in italy! I've been watching the euro situation and just bought some for piecing...because it is made in Italy. It is a great thread and they certainly deserve our business. Would love to win this collection; the colors are great! I need to build up my quilting thread stash! It's a little bare... I can't wait to finish off some UFOs that are cluttering up my sewing room! I will be working on my first Full/Queen size quilt set this Jan! It's cut and ready to go. This year I need to "finish" several projects! Too many ufo's hanging around. I have several quilts to quilt and this thread would be welcomed into my home. aurifil thread is the best! My gosh I have so many quilty plans. I am doing 3 BOM's for the first time, want to use up fabric though I don't have many scraps, have seen several quilts on different blogs that I wish to make as well. Should be a busy productive year. Can you believe that I'm dreaming of Christmas fabric? After all the pressure is off, I think about what I really wanted to make and didn't have the time or inclination to get started on. So I organized my fabrics by color and saw that most of my stash is red and green. What does that say about me? I am going to really work on my Free Motion Quilting this year - that means lots of thread use so the Aurifil would be fantastic! I do want to use different threads to see what works well and the different effects that can result. I'm planning on making quilts for my grandchildren's big girl/boy beds! The project I'm most excited to get started on is a wedding quilt for my daughter. It will be all neutrals with brown stars. I love Aurifil thread and always use it on my applique. Would love to win more colors. I'm hoping to get better at my long arm quilting this year. I want to quilt like many of you on the internet. Hope it's a great quilting year! I am going to start a new BOM that I have had " on hold" for a while. I hope to finish two quilts that I started last year. They are going to be for my spare beds. I think it is about time for me to have quilts of my own. Thanks for the giveaway. I am excited about the thought of finishing that layer cake quiltalong quilt. Already a follower. I am excited about joining my first bee! Can't wait. using my EQ7 to help me design and make a quilt for a challenge with some Jewels of India by Robert Koffman fabrics. I've decided to give trapunto a try this year and I'm going to continue to improve my FMQ which was my "new" thing for 2011. Yes, I'm already a follower, and I'm excited about making a quilt for a friend of mine who's coming to visit me in April..still have to decide my pattern and fabric! I'm excited to finish up some wips, and my son actually wants me to make him a quilt. I've made his a couple before but he has always preferred the ones his grandma made him. exciting! I am just looking forward to all sorts of quilting fun with my new Janome named Naomi!!!!! I can't wait to try some Aurifil. I have all sorts of things planned- some zipper pouches, a plus quilt, a Swoon quilt using Terrain... And so much more. Thanks for the giveaway. I'm excited to make Seville by Cluck Cluck Sew. I'm just starting to gather fabrics for it. I'm going for blues, teals, and greens and still thinking about adding a splash of contrast color. I want to focus on improving my free motion quilting skills and to put more of an effort into using up my stash. I'm really excited to jump right in to the Just Takes 2 Challenge-I'm making my blocks with red & white and since I have never been a prewasher-decided that this one I better be. I have pulled all of the red fabrics that I'll be using & since tomorrow I don't work, I will be washing & ironing all of that fabric, along with taking down the Christmas tree. I have been "collecting" batiks for over a year now and am excited to finally turn them into a quilt this year. Great giveaway. I want to finish a quilt top I'm working on called "Luminous Diamonds." I started it almost 2 years ago and haven't had time to work on it - it has about a bazillion hst's and is going to be gorgeous!!! Although I have you in my Google Reader, I wasn't a follower but I am now. Over the holidays I started free motion quilting and applique, I hope to create an entire quilt using these methods and hopefully, using Aurifil thread! My first quilt of the new year is going to be one using my new 60 degree ruler to make a star design. Can't wait to get started! Not sure what my first sewing project will be as I have many started and this is the year to finish some of the started projects. I would love to win the thread. I have a baby quilt in the works for my newest great nephew. And I've set a goal of completing 1 UFO each month in 2012. Thanks for the chance to win. I'm a follower. This will be the year that I start AND FINISH a bed-size quilt -- I really hope! Am working on an applique BoM from One Piece at a Time am also participating in the Free Motion Quilt Challenge. Would love to try the threads.I follow you via email. Can't wait to try out my new GoBaby and make a baby quilt for my sister. Lots of sewing this year but the quilt is going to be the first project so it is done by May. I just finished piecing a geometric log cabin quilt for my daughter's birthday the end of this month and I am working on a "Movin On" quilt for my 4 year old grandson's new room. I would enjoy using this wonderful thread for the free motion quilting. Thanks for all you do. I hope to finish a 100-block English paper pieced quilt this year. And I also hope to finish a quilt for our oldest granddaughter who will graduate from HS in 2013. I would love to start on the Farmer's Wife quilt this year. I would love to try Aurifil! I can't buy it locally. Thanks for the chance. I already follow! I'm excited about the Flora jelly roll that I won, and I purchased some yardage of it for the borders, etc - gonna use the Garden Paths pattern! Whoohooo! Fun! Thanks for the chance to win - I don't have a LQS around here, so I'd love to win some Aurifil...can't find it here! Thanks for the chance to win some of this wonderfu thread! I've heard so many good things about it! My dear hubby bought me a serger for Christmas so I'm super excited about making some clothing for my girls and trying my hand at a serged quilt this year! Thanks for the chance to win! I have Ricky Tims AccuQuilt GO Dies I haven't used yet and I want to applique them and use Aurifil thread to applique them and use some decorative stitches from my sewing machine. It is the one thread that doesn't shred on my machine. I made a resolution that I would not buy any more thread this year since I had about 200 spools in about every color under and in the rainbow. I plan to use them all to piece my quilt tops with this year...even if it doesn't match! So I need more thread!!!! I love the variegated colors in these threads. I've just started using them in my quilting and want to experiment more. I can't wait to use the new Reunion fabric i got for christmas. Would love a chance to win. I can't find the thread in my area either. Oh the thread looks yummy. I can't wait to try the verigated in my next quilt project which will be a flannel quilt to keep us warm in the winter. I want to try some appliqué this year. I have done a little bit but not enough to really know what I am doing. I also want to try some new quilt blocks. I just joined my first online quilt bee and a just takes 2 quilt group. I am also doing a mystery quilt. Good thing I am retired and can sew every day. I am going to busy this year. I use this thread for piecing for quilts. Love it. Dianne said....During the Christmas holidays I can across a pattern by Rachel Cross. Its a purse pattern called Body Bag. Now you would think it is a huge bag but its the size bag all the teenage girls are buying at Vera Bradley and much more cute. I have 7 granddaughters and can't wait to make some for birthday gifts. I woild love to use some of the aurifil thread to quilt the material Ii will be using. Santa brought me a new sewing machine that I can attempt my first ever FMQ. This would be great. Thanks for the chance. Giving away Aurafil? I must rub this sleep out of my eyes because I must be dreaming! This is my stash buster year so I've got a slew of "scrap" quilt patterns and I'm going for it -- first off will be another Roll Roll Cotton Boll quilt. Thanks for thinking of us. I'm making a snowglobe quilt for World of Charity Stitching. The ladies have been cross stitching snowglobe patterns from VeeandCo Designs and we are turning them into a quilt for a nursing home. I will be finishing a lot of UFO's this year and practicing my free motion quilting. However, I did pick out one new project using Marcia Derse fabrics. I've never tried Aurafil thread, but would love to have the chance to. I am doing my very first quilt along online. It is a sampler type quilt that starts simple and helps me expand my skills as it goes along. Love Aurafil thread so to win would be awesome! I will be making big kid quilts for my 3 grandbabies (7,5,2). I plan to move this summer so hoping they will use them as comfort quilts since Grandma will no longer be living in the same town. I have read so much about Aurifil thread. Have been wanting to try it. Winning some would be a good chance to try it out. I am excited about making a strippy rag quilt in soft flannel for our son and his wife who are expecting their first baby in May!! I am starting the year off by working on several unfinished quilts. Once those are finished I am allowing myself to make a new baby quilt using the Goodnight Moon fabric line. Sooo cute. I have to quilts pinned and ready to quilt. Would love to give Aurfil a try! Thank you. I'm actually excited to make my first quilt. I've never quilted before. I'm waiting on the fabrics to get here. I would loveeee to try out Aurifil thread! I've heard so many good things about it. I follow you via twitter, RSS feed, and also the google friend connect. I am excited to start a quilt for my new grandson, Zack. He is due in May! I haveny tried aurifil, but I'd like to! I am a long arm quilter. To try this thread is actually high on my priorities for this year as I have read about it's virtues and actually sat down just now to find a shop to order some from for my mother and myself as we are both keen to see how it performs and I happened to check through my emails and found that you are giving someaway, great opportunity, thank-you! I've tried Aurifil's lighest weight thread, and I really want to try their heavier weight threads now. I also have some other materials that I can use in the bobbin, and so I am eager to test out the reverse method of quilting (thin on the top, the thick one in the bobbin; quilt loaded upside down). That's my goals for this year. I am going to finish a quilt I am making for my Son's Wedding. I want to hand quilt it. Hopefully with some Aurifil thread. Thanks for the chance to win some thread. Aurifil thread is ,bestest,lintless,colorist ,thread there is!!! I do follow your blog. I want to try foundation piecing or paper piecing this year. I also want to try more Aurifil. So far I've only used the 50 weight, and have one spool of 40 but haven't tried it yet. Thanks. I've long wanted to try Aurifil threads. I'm just working on an Amish style quilt using Cherrywood sueded hand-dyed cloth and think the Aurifil threads would work well for the quilting. Since the quilt is all solids, the quilting has to shine. Great giveaway! I am excited to be taking a free motion quilt challenge. Thank you for the chance to win this thread. I'm challenging myself make queen/king size quilts this year, maybe five! I'm hoping to make a Storm at Sea quilt, using just a neutral and a batik - I've seen one done that way and it's gorgeous! I bought the batik a few months ago - but I made a silly new year's resoloution to finish up some projects before I could start something new, so it's still in the planning stage - maybe by March? My friends and I Just challenged each other to begin and finish a new project within 5 months. My quilt is the largest and hardest one I've ever attempted. Some new Aurifil thread would certainly enhance my challenge quilt. Thanks for the opportunity to win a prize. Happy New Year Amanda! I'm going to hopefully have more time for quilty stuff this year than I did last year! One goal for this year is to do a foundation pieced pattern. I haven't done one before. Thank you for such a great giveaway. I'm crossing my fingers big time because I've never used Aurifil thread but want to badly! My goal for this is year is to make at least 1 (really want 3!!) Christmas quilts for my home. I'm excited for the Flea Market Fancy reprint...I missed it the first time around and love the classic/scrappy colors! Thanks for the chance! I've wanted to try Aurifil for so long! I'm working on a quilt for my dad now that I'm excited to give him, then a bunch of UFO's from yrs begone!! I've heard a lot about Aurifil thread, but as yet I've not tried it, don't know if it's available in Australia yet. Would love to try it. I have several UFOs to finish before I start anything new. I have just finished a generous queen sized quilt. I'm looking forward to trying anything SMALL right now! I'm a follower of your blog (have been for a while, but made it official!) Love Aurifil thread - it's the only kind I use. Thanks for the opportunity to win. I'm very excited to start an heirloom quilt for a new grandbaby, that I just learned will be arriving at the end of the summer! What better way is there to show your love and welcome a new little one into the family than with an heirloom quilt. It's so nice to know that Aurifil is environmentally friendly. I LOVVVVEEEE this thread, when piecing it just melds right into my fabric. As for machine quilting I actually think it glows. Next I'm going to try handquilting with Aurifil. Thank you and Aurifil for the giveaway. I've just started a new quilt that I'm making as a surprise for my Mother, she's moving into a new apartment in March & it will make a great housewarming gift. Thanks for the lovely giveaway, I've only just discovered Aurifil, it really is the ultimate in thread! I need to update my class samples and in the process I am working on accuracy, really, really great accuracy. I want to be Sally Collins good. "Diagonal Delight" with Madame Samm!